If you have worked on very many projects, you realize that they often don’t often follow the original plan. Predecessors are sometimes delayed or resources are sometimes unavailable and plans need to change based on the reality that has actually transpired on your project. Yet the end dates don’t change and it can be difficult to assess how much you are actually deviating from the original plan. A gantt chart with many activities that show varying levels of progress can be difficult to assess. Even though trusted project metrics such as Cost Performance Index (cpi) and Schedule Performance Index (spi) can tell you how you are doing against your plan, it is still difficult to determine just how far off you you may have deviated from the original planned dates. That’s why I like the Burndown chart or the similar S-curve chart. Both types of charts measure planned and actual progress for all tasks in your plan and you can quickly assess just where you stand. The following example will demonstrate how this works. 1. GanttDiva can generate a Burn Down chart or Burn Up chart from your current data. I actually prefer the Burn Up, which shows progress starting a 0 up to the full value of the project, but either style can be produced. 2. The charts are generated based on a physical progress view of your project related to the total possible earned value. The maximum earned value for any given task is equal to its budget and the earned actual earned value is equal to the reported progress * budget. The earnings are distributed equally between the time that the task starts and the current data date for the project. 3. Finally all tasks and their earning distributions are plotted against the total duration of all of the project tasks. 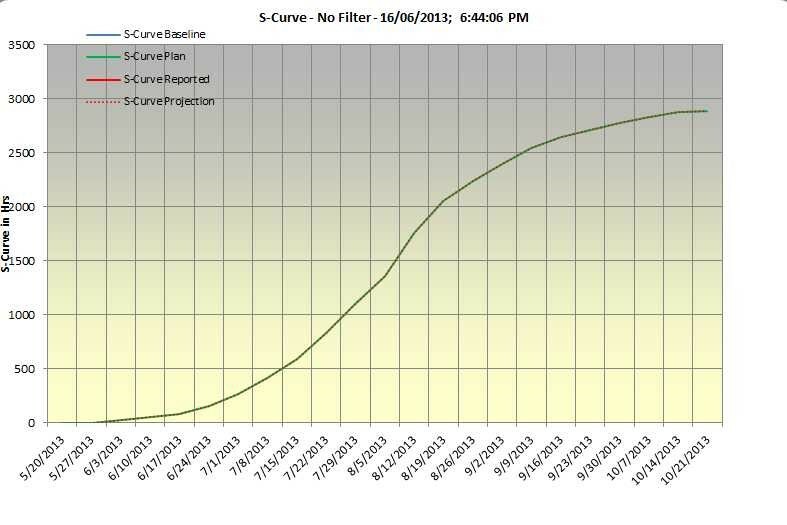 This becomes the curve shown on the chart. The Widget project, distributed as part of the GanttDiva package is used to demonstrate how the overall project progress can be assed via the Burndown chart. A number of tasks show progress, but due to a number of obstacles, the progress has not been uniform. A view of the Gantt chart doesn’t let you clearly see how far we have deviated from the overall plan and how late the overall progress may actually be against this plan. A view of the Key Performance Indicators (KPIs) for the project also shows problems but doesn’t really help to get the big picture. We can see that we are behind schedule and are spending too much to achieve the reported progress, but we still don’t know how late we are versus the original plan. This is where the Burn Up chart can be used to quickly assess the big picture. In the Widget project example, the delay between the actual progress reported and the planned progress can be measured as a delay on the date axis at the bottom of the chart. 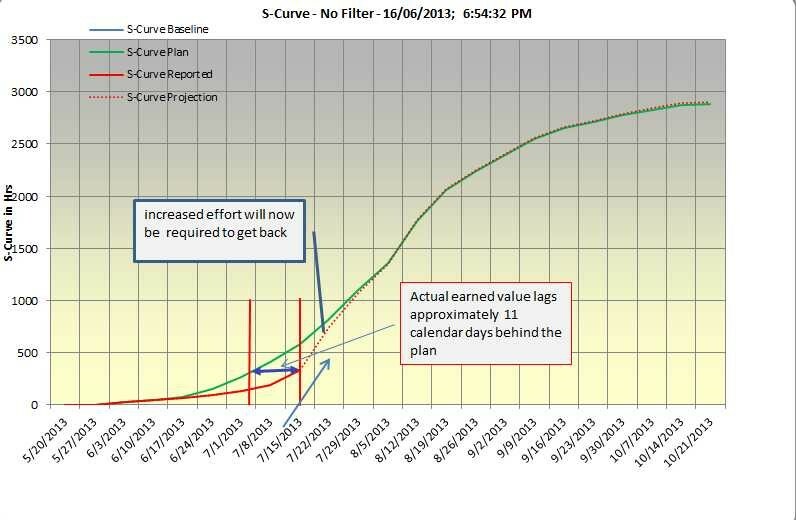 We see that based on the reported progress, the project is about 11 calendar days behind the original plan. This is why I consider the automated generation of Burn Down and Burn Up charts to be so useful and a great feature of GanttDiva. You can create your projects and do your status updates and instantly generate a chart to help you assess the overall project, all within the same tool. In my past experience we always generated these charts in Excel and maintained the project schedule using a separate program. This meant more effort and because the report generation was a manual process in a separate tool chain, it was impossible to get these reports quickly. So please do check out this feature of GanttDiva and let me know if it helps you to manage your projects more easily.